In a state like Pennsylvania where agriculture has played an enormous role from its founding to the present, barns and other agricultural outbuildings are an important part of the rural landscape. Some of these building types are unique to the region because of traditional ethnic modes of construction or specific agricultural activities, and others are universal and may be found across the country. Outbuildings of all types were developed to meet a wide variety of needs. 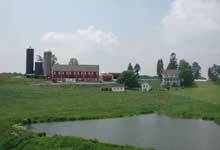 Oftentimes, farmsteads are made up of buildings from many periods, both historic and modern. This is especially true for working farms which have erected new buildings to better adapt to contemporary farming practices. Farmhouses may take many forms or styles and are usually the nucleus of agricultural complexes. Some reflect a traditional vernacular character like the notable PA German Double Door Farmhouse and others may be high style or low style versions of popular architectural styles. Farmhouses may also be of very simple and utilitarian design, taking common housing forms such as the basic center hall I house, gabled ell house, cross gabled house or even modern ranch house. 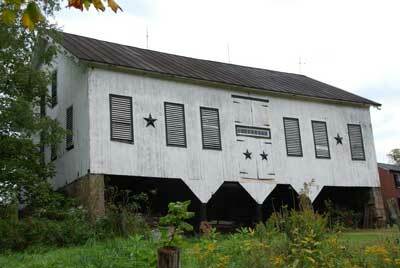 One important feature of many 18th and 19th century PA Dutch farmhouses is the summer kitchen. 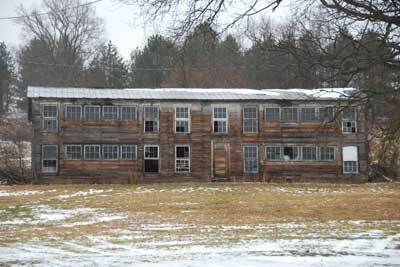 These small one room buildings are usually located just behind the main house. As the name implies, they served as a kitchen during the hot summer months, allowing the living quarters to remain cooler. The summer kitchen's large fireplace could be used for cooking and laundry and other tasks. Many farm complexes include a tenant house, which is usually a smaller, less detailed and more vernacular dwelling owned or leased by farm workers. Sometimes the tenant house is the older house of the farm, relegated to such use when a newer and fancier main house was built. Sometimes such houses were originally constructed for grown children or others as the family expanded. 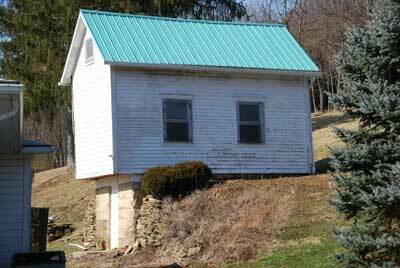 The "dawdi house" is a term for a home built for family elders, close to the main house, in the PA German tradition. This practice can still be seen on the farms of the Amish. Likewise, some early dwellings were converted to outbuilding use when a finer or more permanent house was built. There are many examples of small stone or log buildings that may have begun as houses but later became springhouses, sheds or small barns. Other outbuildings were constructed to serve only one purpose, depending upon the type of crops raised and food processing needs on the farm. These outbuildings are sometimes easy to identify since they are specifically designed for just one use, like tobacco drying barns, poultry houses, root cellars, smoke houses and milk houses. Their form is much dictated by their use. 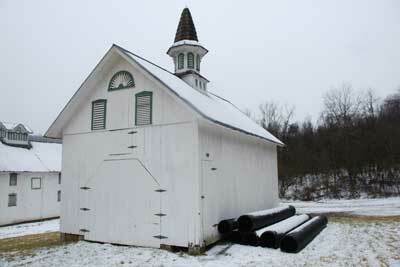 Barns play an important part in the rural landscape and Pennsylvania has many fine examples of many types. One of the earliest types of barns are log crib barns constructed of wooden logs an open interior floor plan and gable roof. One of the most distinctive types of barn in our state is the Pennsylvania Barn, a stone foundation bank barn with a projecting forebay or overhang. Prototypes for this barn can be found in Germany and Switzerland , showing its transplantation from Europe. 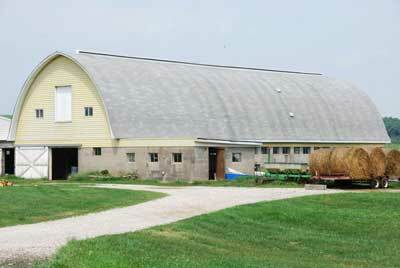 This type of barn is also called a Switzer barn for that reason. English barns tend to be tall and narrow one story buildings that are not constructed into a bank. However, there are also banked English barns as well. Unique barns with decorative open brickwork patterns can be found especially in the southern portion of the state. Decorative elements associated with architectural styles are also applied to barns in the form of cupolas, pointed arched windows and wooden trim. 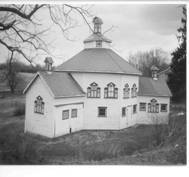 The Star Barn located in Dauphin County is a recognizable landmark of Victorianized agricultural outbuildings, all featuring a distinctive louvered star pattern in the gable roof end and ornamental cupolas. 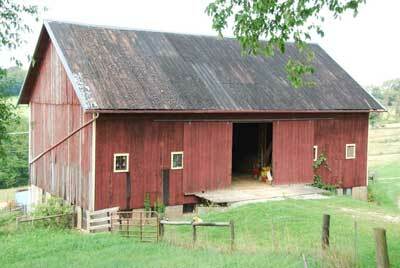 Round, octagonal or polygonal barns apper with some regularity in the state, but are relatively rare. 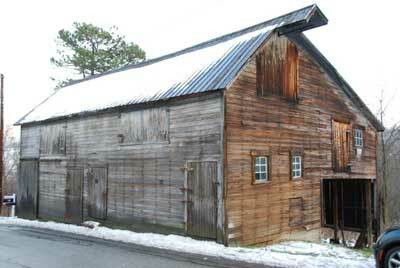 Thus, barns may be strictly utilitiarian structures or show the influence of various styles and vernacular traditions. With so many barns lost to neglect or demolition or altered for new uses, it is increasingly difficult to know for certain what types of barns were common in specific regions or constructed throughout the state. Banked English Barn, Mt. Pleasant Twp., Washington Co.
Pennsylvania Forebay Barn, Bethlehem Twp., Washington Co.
Wisconsin style dairy barn, Hanover Twp., Washington Co.
Springhouse/Wash house, Whitely Twp., Greene Co.
Poultry house, Greene Twp., Green Co.
Carriage house, Greene Twp., Greene Co.
Sheep barn, N. Franklin Twp. Washington Co.